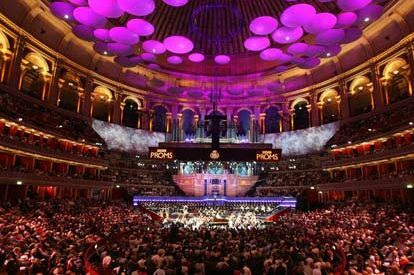 In many years of attending the BBC Proms, I've never before been to one of the legendary Last Nights. So with the enticement of seeing one of my favourite singers, Renée Fleming, I couldn't resist the opportunity to be there and experience the atmosphere for myself this year. In truth, I've always had mixed feelings about the event in the past – not because it's light-hearted, but because it's a bit of a musical mishmash. This year's concert lasted more than three hours, yet there wasn't really a substantial (in terms of length) piece of music in there. Lots of little slices of all kinds of music by composers as unconnected as Tchaikovsky, Parry, Richard Rodgers and Smetana made for an odd meal, in my view, and in spite of the high quality of the performances of certain piece, the marathon programme didn't quite hang together. One of the most enjoyable items came first. The world premiere of Jonathan Dove's A Song of Joys was delivered with vigour and keen attention by the BBC Singers and BBC Symphony Chorus under the baton of Jiří Bělohlávek. This five-minute-long cantata is a powerful setting of Walt Whitman's text, which extols the exuberant joy of music. Dove's nods to the English choral tradition were present in various forms – the opening fanfare, the horn/woodwind colours, the harp flourishes – but his word setting was especially potent, such as in the caesura after the word 'most' in the opening line, followed by the repeated 'jubilant' (the emphasis showing which word matters most to the composer). There then came what was for me a slight overdose of Tchaikovsky in the form of Capriccio italien (Op.45) and the Variations on a Rococo Theme (Op.33). The significance of this double programming escapes me, and I felt something a bit meatier was needed. Admittedly, the performances by the BBC Symphony Orchestra had much to recommend them. In the Capriccio, the opening fanfare was brilliantly pulled off – indeed, the solo trumpet and the brass playing in general was very fine. For my taste, a bit more muscularity and dynamic contrast was needed from the strings, and co-ordination within the sections was not always perfect, but the performance overall was fine. Maxim Rysanov was the viola soloist in his own transcription of the (cello) Rococo Variations. Since we know that it did not express the composer's own intentions, it's perhaps strange that Rysanov chose the Fitzenhagen edition of the piece, but as a virtuoso showcase, the performance was very entertaining. The magical introversion of Variation 3 and the cheekiness of Variation 4 were particularly satisfying; I would have liked a bit more dynamic variety and more warmth in some of the phrasing, but Rysanov certainly pleased the crowd. I confess to being a little disappointed by Parry's Blest Pair of Sirens (1887), which was given a magisterial performance by the orchestra but was slightly wordless in terms of the choral singing (not helped, undoubtedly, but the RAH acoustic). The venue also posed problems initially for Fleming's exquisite but delicate soprano, which was swallowed up by the size of the place in the first song particularly. She delivered five Strauss numbers, and after the singer-orchestra balance issues had settled down, they proved to be the musical highlight of the evening. Fleming's understanding of Strauss's music is by this time completely instinctive, and the combination of an insightful approach to the text and her legendary instrument is irresistible in this repertoire. Pointing the words carefully and floating some phrases with impressive control, Fleming once more proved herself to be a world-class artist, and it's just a shame that the venue is ill-suited to solo vocalists. The frivolousness of the second half brought an increase to the party atmosphere in the hall. Again, Chabrier's Joyeuse marche (1888) was a crowd-pleaser, then Fleming returned to give committed renditions of Smetana's 'Dobra! Ja mu je dam!...Jak je mi?' from Dalibor and the 'Song to the Moon' from Dvorak's Rusalka. At times, there was a lack of synchronicity with the orchestra, and again there were moments where her voice was overwhelmed by the orchestral sound, but the Dvorak was especially impressive, and her artistry was apparent throughout. Rysanov took to the stage for a second item, this time the Prelude and Galop from Vaughan Williams's Suite for viola and small orchestra (1934). To my eyes and ears, it seemed that the violist was less inside this piece than in the Tchaikovsky, but it was an interesting and imaginative choice. The choral forces then took over for the Bridal Chorus from Lohengrin and a rousing nationwide singalong of 'You'll Never Walk Alone' from Carousel in honour of the fiftieth anniversary of Oscar Hammerstein's death. Nic Raine's lively orchestration of the traditional Fisher's Hornpipe signalled the start of the traditional climax to the evening. Fleming returned to sing three verses of 'Rule, Britannia! ', two of them highly embellished. This was impressive, too, though she used the words and seemed to have a different version to the one in the programme (the word 'matchless' was omitted both times). Bělohlávek's speech paid tribute to the musicians and audiences who have participated this season, though didn't entirely connect with the festival atmosphere of the concert; nevertheless, he led rousing renditions of 'Pomp and Circumstance', 'Jerusalem' and the rather special Britten version of the National Anthem, providing a fitting ending to a record-breaking season.